By the way I have tested this on the Vista Ultimate and it works like a charm. This was the easiest way of activating a total of 4 TV Tuner Cards. 2 X Happaugge 150 and 1 x 250. 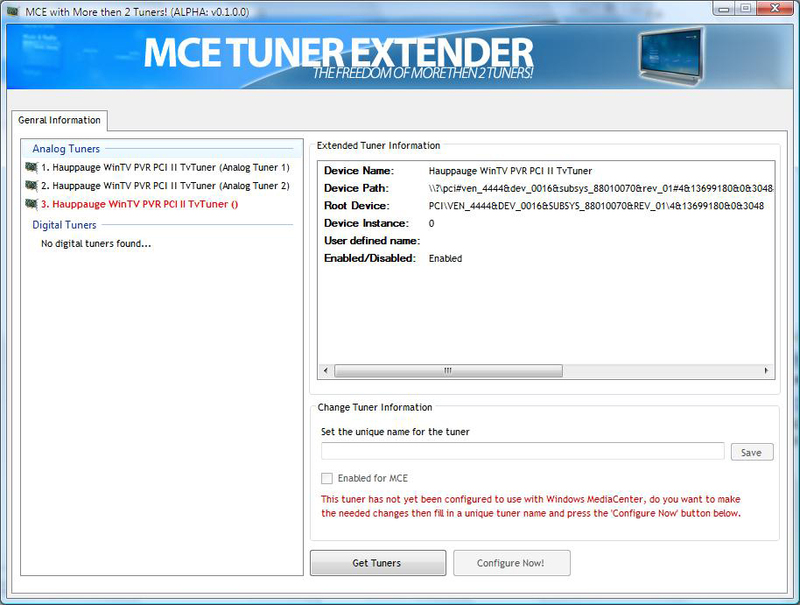 I had it working on MCE 2005 for a few months without a problem and hoped it would work in my test Vista box with the same TV Tuner Setup. It works perfectly. Glad it helped you. I myself run a 3 NTSC tuner setup on my main machine (in either MCE2005 or Vista). 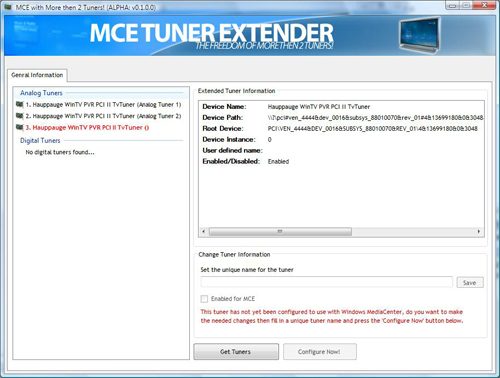 To the first comment--by "this" do you mean the MCE Tuner Extender? Does it also work with Vista? I hope so--it's slick! It should work in Vista. The registry keys for this have not changed between MCE2005 and Vista. Currently the website of Ramon is down and I haven't been able to find an alternative location to download the MCE Tuner Extender tool. Any ideas on where to get it? Im using Vista Media centerand I have a WinTV Nova-S card which is a DVB-S (pretending to be DVB-T) and also has an svideo input.. is it possible to use both of these simultainiously in media center using this app? - the app sees it as 2 digitial tuners, but i cant get it to work!